Tiger Woods is hunting more majors. A REJUVENATED Tiger Woods will head into the New Year excited knowing he's won six of his 14 Major Championship titles on three of the four 2019 host venues. Former world No.1 Woods made a successful return to golf this year after missing most of the previous two seasons through injury. While Woods finished his season with a dramatic, emotional win in the Tour Championship in Atlanta in September, he fell short in the season's Majors, tying for sixth at the British Open and finishing runner-up at the PGA Championship. Next year however Woods' Major campaign will feature three stops on courses where he was won before. As well as four victories in the Masters at Augusta National, Woods has also won at Pebble Beach, venue for the US Open, and Bethpage Black in New York's Long Island, which is hosting the PGA Championship. "The Major venues for next year do excite me as I have won on three of the four," Woods said. Woods said his performances in the final two Majors of 2018 suggested he was close to winning his 15th big one. 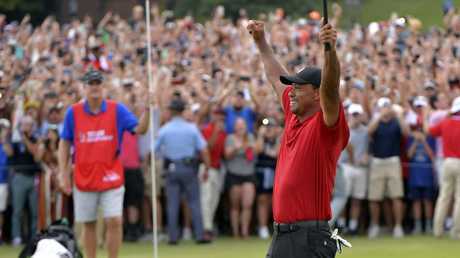 Tiger Woods celebrates after on the 18th green after winning the Tour Championship golf tournament in Atlanta. "What I did in the last two major championships, I gave myself a chance to win both of them and I was right there," Woods said in Albany, where he was speaking ahead of this week's Hero World Challenge. "That's ultimately what we want to have happen. Now it's about trying to get everything to peak together like I did for those two weeks to do it again four more times. That's the trick. "As you look at anyone who's ever played this game, that is the most difficult thing to do in this game. "That's why most people haven't won a lot of major championships, because it's so hard to do. "Fortunately, I was able to do it 14 times and hopefully more in the future." 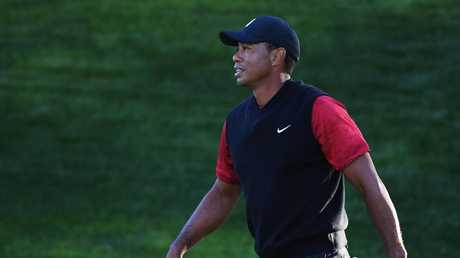 Woods meanwhile said his enthusiasm to represent the United States in team events was undiminished despite an unhappy return to duty at the Ryder Cup in September. Can Tiger Woods win more majors? The 42-year-old said he is determined to be a playing captain when he skippers the USA in the Presidents Cup at Royal Melbourne. Woods would become the first "playing" captain since the inaugural event in 1994 when Hale Irwin captained the victorious USA side. "Yes, I would like to captain the side and there has been that precedent already been set, 1994 when Hale Irwin was captain," said Woods. "If I make the team on points, yes, I'll play." Woods meanwhile defended his participation in last week's head-to-head $9 million winner-take-all contest against Phil Mickelson last week in Las Vegas, which was criticised as a cash-grab by some critics. "I think we've got some positive feedback overall," Woods said of the encounter, which was won by Mickelson. "Obviously, there's some things we can do as far as interaction and as far as play. I wish we both would have played better, but neither one of us putted well that day and there were some tough hole locations out there." "So, maybe going forward, just don't quite have the greens so fast or the pins so difficult, but also as short as the golf course was playing, we should have made at least seven, eight birdies a piece. We just did not."